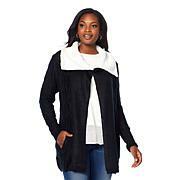 This sweater has the comfort, style and comfort I have known for over 20 years from Jamie. The sleeves are just right to manage your life without problems-uniquely designed to detail. Thank you again Jamie and HSN for this quality-runs true to size. Knockout Fair Isle Sweater in White. Love all the Nordic sweaters, but not the itchy heavy wool. This is so soft and washable. The bell sleeves are a bit long, so I won't be wearing in the kitchen! I ordered the XL for layering over turtlenecks. Lots of ease and room in this mid-weight sweater. I purchased the black and I love how vibrant the color is! Very cute style and forgiving in the waist. I ordered my regular size L. I am 5'6 & 160lbs. I carry a little tummy weight. The only thing I do not love is the acrylic! I am wearing my sweater today for the first time and I can see pilling already on the sleeves which is a bummer at this price. 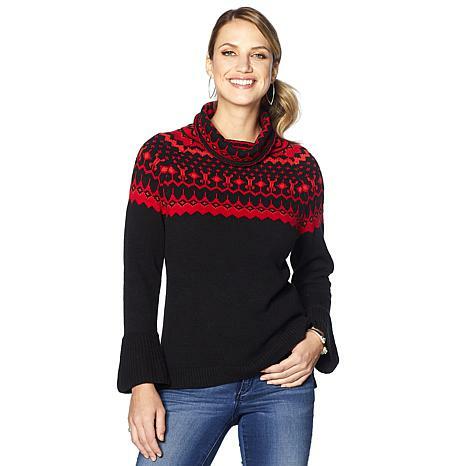 Especially since Fair Isle sweaters can be purchased for a similar price at higher end stores without acrylic. I might get one season from it. I purchased the red and black. I love the colors but this sweater is made with heavy yarn. I'll probably give away after this season.